Electric utilities’ number one objective is to ensure an uninterrupted power supply for its millions of customers – even during extreme weather events or other emergencies. Recent developments in microgrids are empowering utilities to reshape the grid for maximum efficiency and reliability. Microgrid solutions allow for the diversification of energy generation assets and can operate independently, or in conjunction with the main grid, thus eliminating any single points of failure. To further maximize grid reliability, it is now conceivable to create a system that interconnects not only one, but several microgrids that leverage a variety of distributed energy resources (DER): photovoltaic arrays, microturbines, energy storage systems, generators, etc. The challenge rests on the ability to set up a distribution automation architecture to leverage intelligent grid solutions while enabling multiple microgrids to operate independently, or together. Today’s innovative solutions enabling reactive and predictive control of the microgrid’s DER make this possible. This kind of system works with advanced, high-speed communications and distributed grid intelligence to automatically detect faults and switch to alternative distributed power sources. During grid-tied operation of the microgrid, the Software-as-a-Service (SaaS) forecasts and optimizes where to produce, consume, and store energy based on external events such as weather forecasts, demand-response events, and tariff rates. always have a first generating source to respond during an unexpected loss of power. Respecting these three tips, electric utilities betting on microgrid interconnections will be more reliable than ever. For instance, in the event of a power loss caused by extreme weather, the advanced distribution automation equipment and the microgrid controller will autonomously switch to alternative distributed power sources as needed. Acting independently of the main grid, the new microgrid system will automatically restore power with minimal service interruption. Such innovative microgrid projects are blooming across the globe. One of the most outstanding example comes from Texas, where a first-of-its-kind microgrid has been deployed: the electric utility has dramatically improved power reliability and quality, as well as grid security, thanks to the interconnection of four microgrids relying on 9 DER, plugged into the main grid. 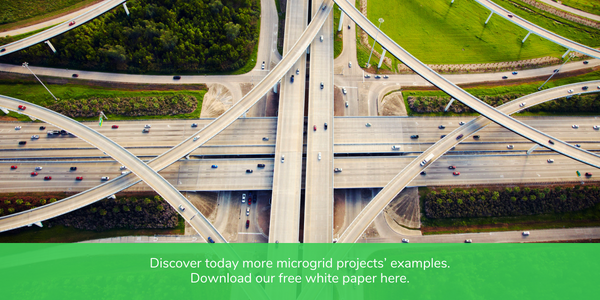 Discover today more microgrid projects’ examples: Download our free white paper “Microgrid Benefits and Example Projects”.